I'm so excited to share with you this new little clutch bag pattern! I've been loving a whole lot of little bags that I see on Pinterest - especially those that have a zipper compartment on the inside - so I decided to incorporate a little zipper pouch inside this little bag. 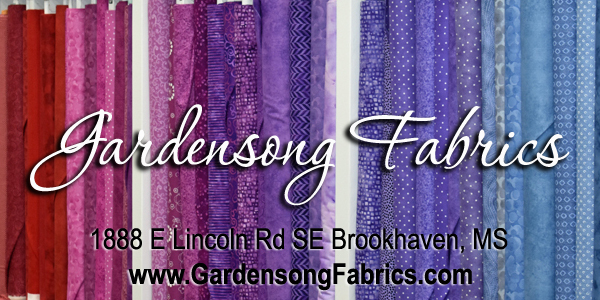 This free pattern uses just over 1 1/2 yards of bias binding. Make sure you use bias binding (binding cut on the diagonal) and not straight cut binding because straight-cut binding won't ease around the corners and look great like you want it to. 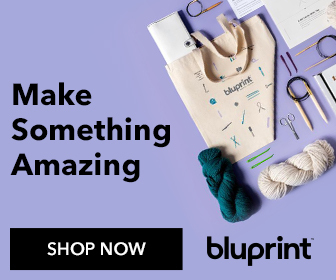 Check out my new video tutorial for making bias binding here to make over 3 yards of beautiful high-quality bias binding from any fat quarter. Finished dimensions: approximately 7'' wide x 5'' tall, not including the strap. Who's the famous maker? You! Download the pattern template from my Craftsy Shop here. You'll also need to cut or piece together a 3'' x 50'' piece of fabric for the strap (or your desired length). 1. Make a sandwich out of the two 10'' x 15'' fabric rectangles and the piece of flexible foam interfacing of the same size. Use basting spray (if desired) to adhere the wrong sides of the fabric pieces to either side of the stabilizer. Use pins to hold the fabric in place if you are not using basting spray. 2. Sew quilting lines across or all around the rectangle however you like. I used my walking foot to sew simple straight lines about 1'' apart. For this part, you will need the four fabric pieces cut from fabric (not quilted fabric and stabilizer) and the zipper. 1. Lay the zipper across one of the zipper pouch lining pieces, right side up. Align the top edges. 2. Lay a zipper pouch exterior piece right side down and align the top edges. Pin the layers together. 3. Sew across the top edge with a 1/4'' seam allowance. A zipper foot is very helpful if you have one. 4. Fold the fabric pieces wrong sides together and press them carefully away from the zipper. Topstitch along the fabric, 1/8'' away from the fold. 5. Place the other edge of the zipper against the remaining zipper pouch lining piece. Align the top edges. The two lining fabrics should be right sides together. 6. Place the remaining zipper pouch exterior piece on top, right side down. Align the top edges and pin in place. Stitch across the edge with a 1/4'' seam allowance. Press and topstitch as before. 7. Fold the zipper pouch so that the lining pieces are right sides together and the zipper is at the top. Open the zipper halfway so the slider won't get cut off. Sew with a long basting stitch all the way around the 3 curved edges, 1/8'' from the edge. Trim away the extra zipper tapes. 8. Lay the quilted piece for the bag back and flap on your work table, lining side up. Place the zipper pouch on top and align the curved edges at the bottom. Pin in place. 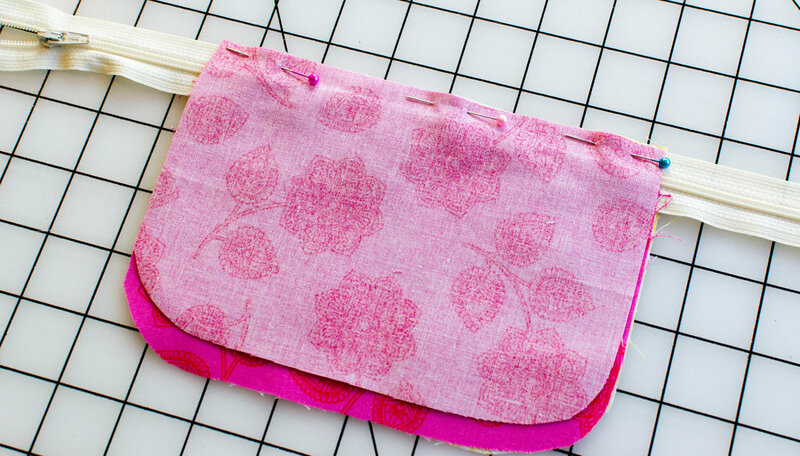 Baste the zipper pouch to the bag back, sewing on top of your previous basting stitches. Fold the gusset strip in half and mark the middle on both sides. Fold the bag front piece in half and mark the middle along the curved bottom edge. 2. With the lining sides together, match the middle of the gusset strip with the middle mark on the bag front piece. Place a clip at the center and then clip the gusset strip around the curved corner. Tip: cut small 1/4'' snips into the gusset strip to help it curve around the corners. After one side is clipped together, work from the center again to clip the rest of the gusset to the bag front, wrong sides together. 3. Sew the gusset to the bag front with a 1/4'' seam allowance. 4. Cut a piece of bias binding 2 1/4'' x 15''. Fold it in half with the wrong sides together. Working from the front side of the piece that you just attached the gusset to, sew the binding strip to the edge with a 1/4'' seam allowance. Trim away any extra binding. 5. Fold the binding around to the gusset and clip in place. Stitch the binding down close to the edge. Tip: On top, use thread that matches your binding. Use bobbin thread that matches your exterior fabric. 1. Fold the 3'' squares in half and press. Open and fold the edges to the center, press. Fold in half again. Press. 2. Topstitch along both long edges 1/8'' from the edge. 3. Pass a tab through a D-ring and fold in half. Baste the raw edges of the tab to the top of the gusset on one side. Repeat to sew a D-ring tab at the top of the gusset on the other side. 1. Cut a piece of bias binding 2 1/4'' x 11''. 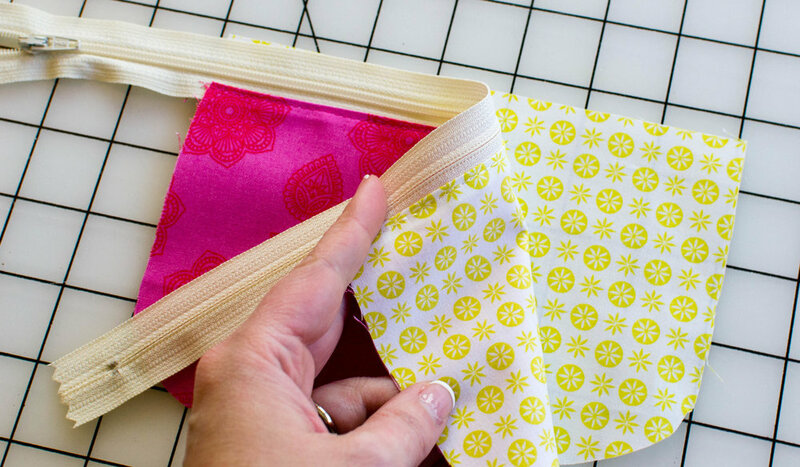 Fold it in half lengthwise and sew it to the top edge from the right side of the bag front. The binding should run all the way across the top of the gusset on one side, across the bag front, and across the gusset top on the other side. 2. Wrap the binding around to the inside and clip in place. Stitch close to the edge of the binding. 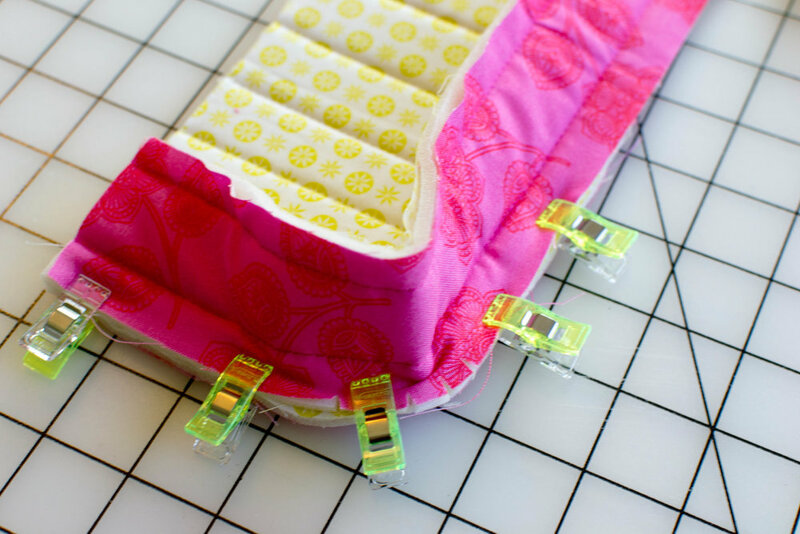 Tip: Fold the D-ring tab up and out of the way so it won't get stitched down when you sew down the binding. 1. On the bag back/flap piece that has the zipper pouch basted to it, mark the center at the bottom edge. Clip the bag front to the bag back, matching the center marks first and then clipping around the corners. Cut small snips into the gusset to help ease it around the corners, as before. 2. Sew the bag front to the back with a 1/4'' seam allowance, going slowly. 3. Cut a piece of bias binding 2 1/4'' x 28 1/4''. Place the short ends together and sew with a 1/4'' seam allowance. Press or finger press the seam open. Fold the binding strip in half, wrong sides together. Mark the binding in quarters. Working from the exterior side of the bag, clip the binding around the edges, placing the quarter marks at the middle of each side. Sew the binding in place with a 1/4'' seam allowance. 4. Turn the binding around to the inside and clip. Stitch down close to the edge. 1. On the inside of the flap, make a mark that is centered and 1 1/2'' from the edge. Attach one side of the magnetic snap, centered over this mark. Now you've got the prongs of the magnetic snap showing on the front of your bag. Never fear! 2. From your binding scraps (or other fabric), cut a rectangle 2 1/4'' x 1 1/4'' as well as a 2 1/4'' x 1 1/4'' piece of felt. Adhere the two together with basting spray. 4. Make a mark on the front of the clutch where the other side of the snap should go. Install it using the manufacturer's instructions. 5. 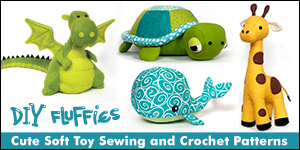 Use a thread spool to trace a small circle of felt. Use hot glue or fabric glue to attach the felt over the snap prongs on the inside of the bag. 1. Fuse the interfacing to the wrong side of the 3'' x 50'' strap piece. Fold the long strap in half lengthwise and press. Open and fold the raw edges to the center and press. Fold again and topstitch 1/8'' away from both long edges. A walking foot can really help you sew your strap without warping or twisting. 2. Pass the end of the strap through the opening of a swivel snap clip. Fold the raw edge under and sew a small rectangle to secure the clip. Repeat to sew another swivel snap clip to the other end of the strap. Optional: sew the strap directly to the D-rings instead of using swivel snap clips. Take a picture and tag me on Instagram @sewcanshe so I can see it! I'm adding this free sewing pattern to my 'Ultimate List of Fast and Easy Tote Bag Patterns.' Check it out!